As some of you know, I've worked for the Salt Lake County Library System for many years. One of the things the library does in all its branches is a program called Great Reads for Girls. It's a book club for girls grades four and up. Moms are encouraged to read with their daughters too. 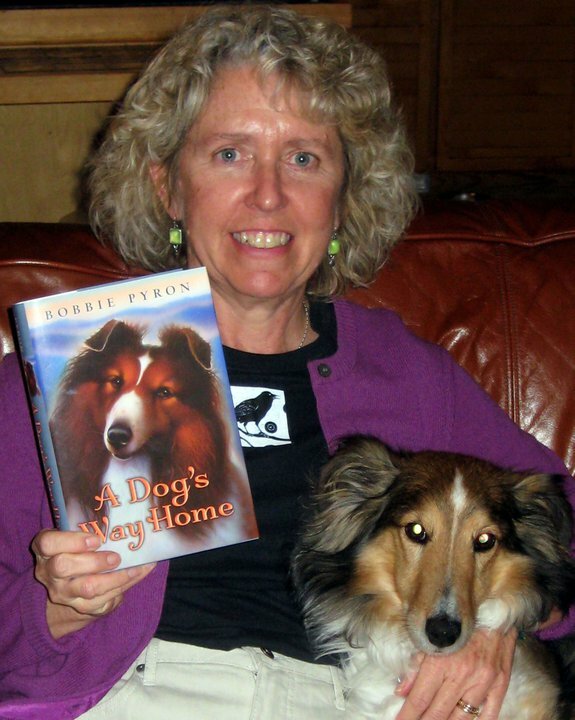 One of the books Great Reads for Girls is reading this year is A Dog's Way Home! I will be visiting with each book club at their library over the next seven months, talking with them about my book, being a writer, and anything else they want to talk about. In addition, my very good friend (who also works for the library system), Susan Hamada and her rescued sheltie, Chloe, are visiting the groups too. 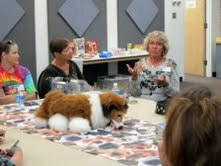 Chloe (a three-legged sheltie) and Susan are a registered therapy team. 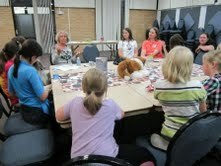 So this past Tuesday night was my first visit with a book club, and boy was I nervous! But the staff and the girls (and their moms) at the Kearns Library made me feel soooo welcome! Many of them brought donations--toys, treats--to donate to Sheltie Rescue of Utah. Susan brought the most beautiful Chloe. The girls were quite smitten with her! I talked with the group for an hour about how I became an author, what inspired me to write the book, and what it's like being a writer. They also asked me great questions such as: What is your favorite book? Where's your favorite place to be? Which do you like better, being a writer or being a librarian (that was a tough one to answer! ), and many more. 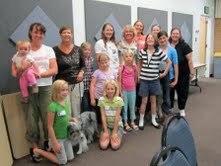 They were a great group, and I enjoyed hearing about their dogs too! Can't wait until my next book club visit! 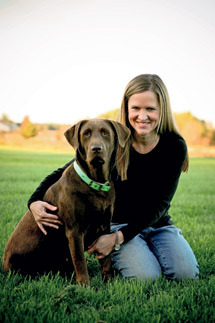 Fido and Friend in Five: Stephanie Stuve-Bodeen, Pua, and Leilani! Like many states, Utah has an annual children's book award contest called the "Beehive Award." Every year, teen novels, middle grade novels, picture books, poetry and non-fiction books are voted on by the kids of Utah to select the best one in each category. One of the picture books this year is a charming, funny, delicious picture book called A Small Brown Dog with a Wet Pink Nose, by Stephanie Stuve-Bodeen. In this utterly wonderful story, a very clever young girl named Amelia needs a dog in her life in the worst way--a small brown dog with a wet pink nose. Her parents do not agree. Now, there's a plethora of picture books out there about kids trying to convince their parents they need a dog. This is not a new plot by any stretch of the imagination. What is so wonderfully fresh about Stephanie's tale is how Amelia goes about convincing her parents. No tantrums for Amelia. She's much smarter than that. 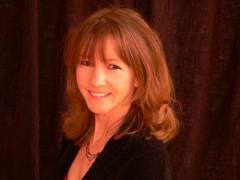 Stephanie is a multi-multi award-winning author. Her teen novel, The Gardner, was named a Best Summer Read by "Good Morning America." Her picture book, Elizabeti's Doll, won the Ezra Jack Keats New Writer Award among many other awards, and her other teen novel, The Compound, won the Maryland Black-Eyed Susan Award and was nominated for many other awards. Of course, when I saw Stephanie's photo on the back jacket flap of A Small Brown Dog with a Wet Pink Nose, and she had her arms around a very handsome lab, I had to write to her. Turns out she shares her life with two dogs, Leilani and Pua. Let's get to know this trio in this week's Fido and Friend in Five! 2. What makes Leilani and Pua's tails wag? 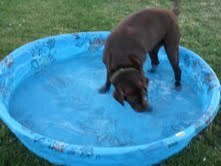 Leilani, the chocolate lab (in the author photo I saw) loves her kiddie pool. She stands in it for hours and digs. 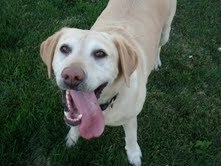 Pua, the yellow lab, is obsessed with fetching. We're on our second tennis ball thrower of the year, because she wears it (and us) out. She's into frisbee lately, and she carries it everywhere, just in case. And they freak out when I pick up the leashes, because they love walks. I take them two miles every morning. 3. What's your all-time favorite dog story? Has to be Where the Red Fern Grows. 5. In five words, tell us what Leilani and Pua mean to you: They are my daily constant. Boy, that's something all writers need! Thanks so much to Stephanie, Leilani, and Pua for taking a break from writing, ball chasing, eating, and kiddie pool playing to be in today's Fido and Friend spotlight. 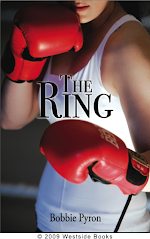 Be sure to visit Stephanie's website to find out more about her books and read her blog. About three years ago, I had a-little-past-midlife crisis. So did my husband (we're the same age). His mid-life crisis took the form of a little red and black Smart Car. Mine took the form of a little blue merle Sheltie named Sherlock. I hadn't really planned on a third dog, although I was suddenly (and sadly) aware that all of our animals (including our cats) were getting older. One day, we were visiting Jim and Barbara of Sheltie Rescue of Utah. Barbara had just had knee replacement surgery and we were stopping by to bring them food and to visit. As always, they had quite an assortment of shelties! They had just a month before pulled three shelties from a puppy mill situation. The dogs had been in bad shape when they came into Barb and Jim's program. They were underweight, skittish. The female was nine years old and still being bred. One of the three was Sherlock. He was the stud of the puppy mill. He came up to us very shyly and pawed my husband's leg. I was struck by how much he looked like a little version of Boo! He was quiet and shy and bossed around by the other dogs. Of course, I was utterly smitten. A couple of weeks later, I brought him home. One of the things about puppy mill dogs is their lack of normal experience. He wasn't well versed in grass, was terrified of stairs and kept running in to things--particularly the glass sliding door. When I took him in to meet our vet, I asked him to give his eyes a good check. I was convinced he was partially blind. His eyes were, in fact, fine. As our vet explained, because they live in such a confined space most of their lives, puppy mill dogs don't have great depth perception. He assured me Sherlock's brain would develop that particular function just fine. And as always, he was right. I would love to say adding Sherlock to our pack was seamless, but that wouldn't be the truth. Teddy despised him, and Sherlock (having been a stud) challenged Boo's authority every chance he got. Boo, bless her heart, was patient with him for a while. Then one night in the kitchen, she'd had enough. She threw him to the ground, belly up, and clamped her jaws on his throat. My husband freaked. Sherlock peed on himself, and they've been best buddies ever since. I can't begin to tell you how wonderful and fun and rewarding it's been to watch Sherlock's personality blossom over the last three years! As it turns out, he's quite the little pistol. As if making up for those first horrible three years of his life, he does everything--running, playing, eating, barking, cuddling--with 200% enthusiasm. He loves small children, cardboard toilet paper rolls, tangerines, and our cat, Kami. At six, he's a bit more reflective perhaps, a tiny bit mellower. Would I have three dogs again? Probably not. But Sherlock makes me laugh every day. And I wouldn't trade that or the look of pure joy on his face when he runs for anything. So six months after we adopted Boo, I wanted to adopt a purebred sheltie. 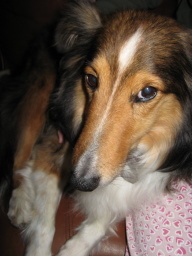 I'd had Tulla for all those years who was mostly sheltie, and she was such an exceptional dog. I wanted to see what a purebred sheltie would be like. Besides, Boo had made it abundantly clear she wanted a dog companion. I'd been in touch off and on with Sheltie Rescue of Utah and had helped them in a few volunteer situations. They had several possibilities for adoption, so my husband, Boo and I drove down to Salt Lake to meet a possible match. The shelties were all lovely and wonderful. Boo got on fine with all of them. But I just didn't connect in that special way with any of them. Until Barbara brought Teddy into the room. He sauntered straight over to me, grinning that sheltie grin, and lay his chin on my knee and gazed up adoringly with his rich chocolate eyes. I melted. It was love at first sight. But there was a catch: Teddy had already been adopted by a family. They'd be picking him up the next day. I was heartbroken, to say the least. I went home trying not to feel sad--I mean, he had found a forever home, hadn't he? Then, about two weeks later one night, Barbara called. "Are you still interested in Teddy?" she asked. I about dropped the phone. As it turned out, the father of the family was terribly allergic to Teddy. They tried all kinds of special shampoos and pills (for the dad) but nothing worked. Heartbroken, they returned him to Sheltie Rescue. I was down there in a New York minute to pick him up. It was meant to be. That was eight years ago. Teddy has truly loved me in a way no other dog has. The two things he lives for is me and food. That's it. 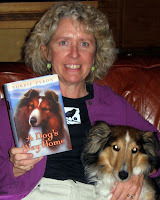 It was his love and devotion to me that inspired me to write A Dog's Way Home. 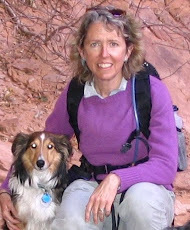 One day, when hiking way up in the mountain with Boo and Teddy--Boo out searching for critters, Teddy glued to my side--I tried to imagine what Teddy would do if we were separated and he had to survive alone in the wilderness. I knew without a doubt, he'd do everything he could to get back home to me because I am his girl. Teddy will be thirteen soon. He sleeps a lot of the time and no longer chases Boo in the back yard. He can't hear worth squat, and cataracts now film those gorgeous brown eyes. But he still loves me with an unwavering heart. I am still, and will always be, Teddy's girl. I had a sheltie mix named Tulla ("Toola") for almost seventeen years. When she passed over the Rainbow Bridge, my heart was utterly broken. She had been with me through my first marriage, divorce, ten years of "just us girls" and then re-marriage. Finally, after eight months dog-less, I started thinking about adopting another dog. I contacted a friend of mine at a no-kill animal rescue and told her I was looking for another sheltie mix, or a purebred sheltie. About a week later, she emailed me and said they'd just pulled a sheltie mix from a "kill shelter." She attached a photo of this so-called "sheltie mix." I laughed when I saw it: there was no way this dog had any sheltie in her. She looked more like a fox with a blue merle coat. Still, my husband said it wouldn't hurt to go take a look. Yes, the infamous going to "just look." As soon as they let this wild, scraggly dog into the room where we sat on the floor, she threw herself into my husband's lap, belly up, and gazed into his eyes with pure adoration. As you can guess, we came home with her. The shelter had named her Calamity Jane. Since we were adopting her just days before Halloween, my husband named her Boo. At first, I thought it was a stupid name. But it really does fit her somehow! From the beginning, Boo was not an easy dog. For starters, she was sick and emaciated from living on the streets. The other problem was convincing her that our cats were not fast food! But I think my vet summed it up best. When he first saw her, he said, "Where'd you get that coy-dog?" In other words, I had adopted a dog who is part coyote. Then he said to me, "She will be the smartest dog you've ever had, which can be a blessing and a curse." No truer words were ever spoken. I've never had a dog (and I've had lots of really smart dogs) who can problem solve the way she can. You can just see those wheels turning behind her amber eyes. In some ways, she was the easiest dog I've ever trained because she picked things up so fast; in other ways, she was very hard to train because she's, well, part wild. Of my three dogs, she's the most sensitive to pack dynamics. She loves us and is not at all happy when we are not all together. She even loves the cats. She's terrified of fireworks but will charge a bull moose. She loves her toys with abandon, and certain people. She was the model for Tam's friend, the little coyote, in A Dog's Way Home. Now at age eleven, Boo doesn't chase deer quite the way she used to. She can't run down a rabbit anymore, and the vet says she has a cataract in one of her beautiful amber eyes. But she's still my go-to dog for any outdoor adventure I want to have. She is my muse, my best girlfriend, and my husband's forever dog. She's our Boo. So this week is National Dog Week! 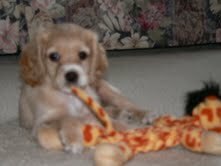 I kicked it off yesterday with a new Fido and Friend in Five spotlighting the author Bruce Hale and his dog, Riley. I thought I'd post something every day this week about dogs who are important in my life. I wanted to introduce you today to Tam (short for Tam Lin), the main dog character in my book A Dog's Way Home. That's his beautiful face on the book cover. Tam is a three-year-old Shetland Sheepdog who lives with "his girl", Abby, in the Blue Ridge Mountain of western North Carolina. Like all shelties, Tam is very smart and 200% devoted to his person. Although he loves exploring the woods, old apple orchards, and creeks on the farm where they live, he is happiest when he's curled up next to his girl, and everything is as it should be. But one late Fall day Tam and Abby's lives are forever changed when they are torn apart from each other and seperated by over 400 miles of winter wilderness. Tam knows of only one thing to do: find his way back to his girl. Tam has made a huge difference in my life. 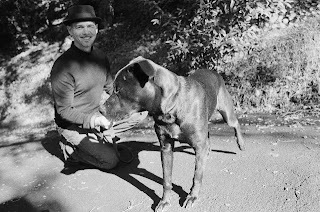 In order to write his story, I had to immerse myself into the skin and soul of this dog--and dogs in general. I had to see what he would see, feel what he'd feel and experience as he traveled home. By writing his and Abby's story, I've connected with readers of all ages all over the world. Hardly a week goes by that I don't get an email from a reader who tells me how much the book meant to them. Often they include photos of their own dogs! Sometimes parents will include photos of their child reading my book. It's all very wonderful and humbling. It's why I (and most authors) write. Tam brought that "heart connection" into my life. I couldn't have done it without him! Fido and Friend in Five: Bruce Hale and Riley! 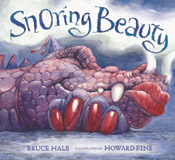 Author Bruce Hale is one of the busiest, most dynamic guys out there! When he's not writing and illustrating books in his popular Chet Gecko Mysteries, Prince of Underwhere and Pirates of Underwhere series, he's traveling all over the place visiting schools, teaching in workshops, and performing on stage, television and film. I caught up with him in August in L.A. at the annual SCBWI Conference. I took a one day intensive workshop with Bruce on creating dynamic presentations. Boy, was he dynamic! None of us felt like we could possibly ever be as funny and engaging as Bruce. But the thing was, he truly believed we could be. He genuinely wanted us to do well. When I gave my pretend school presentation on A Dog's Way Home, I got the definite vibe that Bruce is a dog person. I checked out his website and sure enough, he had many photos of his lovely dog, Riley. When he's not doing all the above, he's out hiking, biking, surfing, and playing jazz music near Santa Barbara. My theory is Bruce needs no sleep. None. 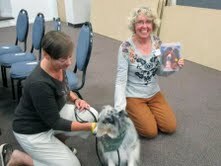 So you can see why I was truly amazed and honored he took time out to take a turn in the Fido and Friends spotlight! 1. How did you and Riley find each other? My wife and I went to DAWG, a rescue shelter, "just to look." We weren't intending to adopt a dog quite yet, as we had a brief trip coming up. But then we met Riley. At six months old, she was a sweet, yet determined pup. We went by DAWG twice to take her for walks , and that was it--we were smitten. After a "checking out period" and filling out a few papers, DAWG let her come home with us! 2. What makes Riley's tail wag? She's keen on Trader Joe's "greenies" snacks--those always get her tail wagging. But so does a good session of lovin', when you're scratching that particular spot on her back. 3. What's your all-time favorite dog story? When I was a kid, I loved White Fang and Call of the Wild, stories of wolfish dogs (and actual wolves) in the Frozen North. Those are the main ones that've stuck with me. 4. If Riley could change just one thing about you, what would it be? I suspect Riley would prefer it if I always came outside to hang with her, every time she goes in our back yard. But, my workload being what it is, she doesn't always get what she wants, poor thing. 5. In five words, tell us what Riley means to you: Laughter, love, playfulness, and wags. Thanks so much, Bruce and Riley! Be sure to check out Bruce's website to see what all he's up to. You'll be amazed! 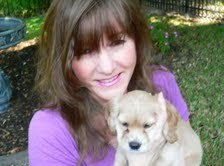 Fido and Friend in Five: Danette Haworth and Casey! Danette Haworth's new book is not just a "dog story", although it certainly is in the best sense of the phrase. Me and Jack, is also the story of one community's struggle with the devastating effects of the Vietnam War and howwar can divide good people. The book is also a coming-of-age story about a boy learning to fight for what is true and dear. And like Danette's other two books, there's a hint of magic. 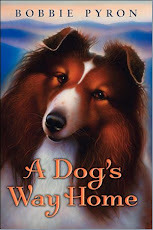 Danette's book reminds me very much of two other books (and authors) in the Fido and Friend spotlight: Letters from Wolfie, by Patti Sherlock, and Finding Jack, by Gareth Crocker. Danette drew on her experiences growing up as a "military brat" to portray the world of her her narrator, Jack. I'm also happy to say Danette is a fellow Floridian. Her earlier book, Violet Raines Almost Got Struck by Lightning, is set in my home state and is on my bedside table waiting to be read. 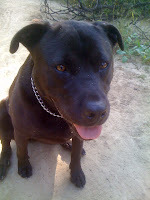 Danette shares her home in Orlando, Florida with her much loved dog, Casey. Let's meet them both in this week's Fido and Friend in Five! 1. How did you and Casey find each other? A friend of mine adopted a really fluffy dog that greeted me wildly every time I visited her. He scampered about the house while we visited, his toenails clicking against the wood floor. She once started to close him in a room, but I begged her to leave him out with us. I began to look forward to seeing him almost as much as my human friend. I hadn't had a dog of my own for about eight years, and Alfie was the first dog to capture my heart in a long time. I would've kidnapped him were it not for my love for my friend! Searching high and low for Alfie's clone, I came upon a woman whose dog had just had puppies. One of the females was sandy colored with a white snout and freckles! I just knew she was the dog for me. My kids and husband and I couldn't wait until she was old enough to bring home. And we couldn't get enough of her once she was here. For days, we debated her name. It couldn't be anything too girly, because the two boys and one man in the family didn't want to be shouting, "Prettyfrillybottoms! C'mere, Prettyfrillybottoms!" (this cracks me up every time I read it) It was hard to find a name five people agreed upon; finally, we went with majority rules, and that's how Casey got her name. 2. What makes Casey's tail wag? One of the best parts of having a dog is how happy they always are to see you. If I go out to check the mail and come back in, Casey greets me, her tail wagging with great flourish and bounding about the house as if I've been away at sea. The sound of plastic, the rattle of foil, and the pull of the refrigerator door--any sound that means food is a big tail wagger as well. 3. What's your all-time favorite dog story? It's not a classic, but I really like the movie "Good Boy." It's about a dog who's been dispatched to this planet to check on the dogs who were supposed to colonize the earth. He's shocked when he sees the state of affairs: dogs as pets! He's extremely opposed to a boy's efforts to befriend him and tells him so. But of course, they do become friends, and the boy helps the dog in his efforts. I don't want to spoil the ending for anyone, but it caught me by surprise and involved a big sacrifice. 4. If Casey could change just one thing about you, what would it be? If Casey had her way, I would be throwing her red "Wubba" twenty-four hours a day. 5. In five words, tell us what Casey means to you: This is how Casey makes me feel: I am important and loved. Or I always have a friend. Thanks so much Danette and Casey! I'm going to see right now if I can find that movie, "Good Boy", and I can't wait to read your other two books Violet Raines Almost Got Struck by Lightning and The Summer of Moonlight Secrets. And be sure to visit Danette's website to find out more about her and her books! 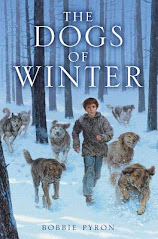 I'm the author of The Dogs of Winter (Arthur A. Levine Books), A Dog's Way Home (Katherine Tegen Books) and The Ring (WestSide). I'm a long-time book lover, and a passionate dog person. I live in the high country of the Utah mountains with my husband, three dogs, and two cats. Life is sweeeet!